Understanding the psychology of anticipation can make you a more successful marketer. Image source. I love digging into the psychology behind conversion. So much of conversion optimization depends on psychology — the way people think, why they click and how they respond to messages. As marketers, we need to understand this psychology so we can become more successful. One area of psychology that affects conversions is anticipation — mentally preparing for and expecting a certain outcome or result. We often refer to a person’s anticipation as being “high” or “low” but what does this actually mean? 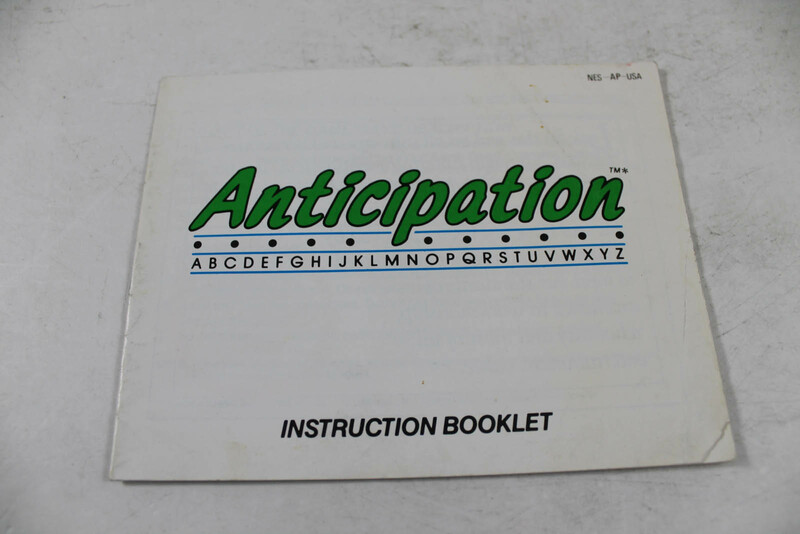 How does anticipation impact what we do as marketers? There are three points about anticipation that I want to explain to you. As you begin to understand the psychological process of anticipation, you’ll become more skilled at implementing techniques that match the psychological needs of users. Hang on. I’m going to get a little scientific, but I think you’ll get it. We can’t stop anticipation from happening. The human brain is always on and always working. 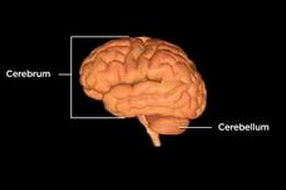 Anticipation is rooted in the portion of the brain known as the cerebellum, which controls “automatic, “non-thinking” behavior. With this anticipation always in play, the human brain desires more dopamine. Dopamine is a chemical neurotransmitter. It’s released from the brain’s frontal lobe and acts as a stimulant that prevents pain, stimulates arousal and causes excitement. Dopamine stimulation happens when we experience and expect good things. Anticipating positive events sustains the output of dopamine into the brain’s chemical pathways. Scientific experiments show that most people anticipate future positive events, as opposed to future negative events. In the absence of anxious/depressive psychological disorders, people automatically anticipate happiness more than they do sadness. It doesn’t matter if you’re an optimist or a pessimist; the brain is wired to anticipate positive experiences. What does this have to do with conversion optimization? There are several important takeaways here. First, you should drive positive anticipation even further by creating copy that makes people agree with you. Since humans are wired to anticipate positive events, you want to affirm this anticipation. 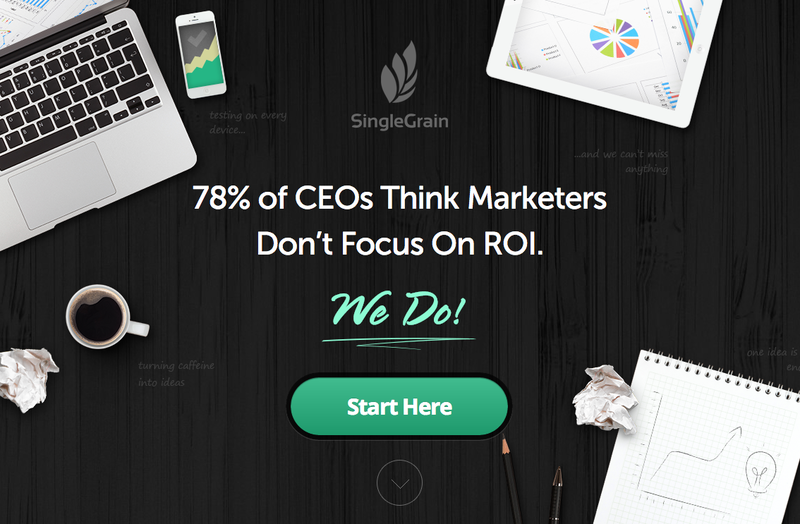 You can do so with messaging on your landing page that gets them to nod in agreement (in a cognitive way, of course). You can’t help but agree with Single Grain’s headline. Depending on your audience, these statements will be met with agreement. The cerebellum anticipation meets the cerebrum confirmation (told you we were going to get science-y). Together, the two form a strong mental preparedness for an overall positive experience. This sets the stage for increased conversions. Drive positive anticipation by creating copy that makes people agree with you. Second, you should create an environment on your landing page that improves the expectation of happiness. Using the psychology of color, choose color schemes that are associated with positive feelings and happiness. Use fun pictures or pictures of people smiling. Each of these creates a sensation of happiness which prompts dopamine release, increases positive anticipation and makes the user more likely to respond positively when faced with the call to action. Third, you should shape your call to action in a positive way. A positive psychological setup results in a positive psychological outcome. The call to action, whether it’s a button or a form, should be presented in a positive light. Use works like “yes” on the button copy and strong, positive action words (like “get”). Positive button copy on the QuickSprout blog. The psychological cards are stacked in our favor. We simply need to push the happiness button further and watch it trigger a conversion. Here’s how anticipation works in a nutshell: The mind draws from past experiences to both predict and prepare for future events. In short, past performance, future tasks and the comparison of the two form the landscape of perceptual anticipation that affects our behavior and response. Here’s an example. If you have a car and know how to drive, then you’ve probably come to a stoplight many times. You know how far in advance to start breaking, how long a yellow light lasts and how to respond when the light turns green. Your hundreds of previous experiences at a stoplight determine how you respond to traffic signals. What if you’re traveling somewhere new and you discover a traffic signal that is shaped differently? Maybe the light is positioned horizontally instead of vertically, or it is situated to the right of the road instead of directly above the road. Well, you still understand the basic signalling — green means go and red means stop. But what if there were a whole new set of colors? Maybe there are four colors — an extra blue light, maybe. What does that mean? Or, what if there are three different colors — orange, purple and blue? Then how would you respond? Your traffic signal paradigm is shattered and you’re confused. Your perceptual anticipation can no longer tell you what your actions should be. If you want customers to flow easily through your conversion funnel, you need to follow the pattern set by hundreds of other conversion funnels. Most web users have some experience with conversion funnels. They have a set of expectations regarding what comes next. They anticipate. Visually, they are looking for anchors — cues for taking action or completing the next step. To take a concrete conversion example, let’s talk about buttons. A button on a website is nothing more than an arrangement of pixels with various colors and a bit of text. However, a user is anticipating the button to be there and for that button to shift the experience in a new direction. In order for it to be effective, the button has to share the characteristics of other buttons that the user has clicked in the past. Users know what to do with the button and they understand what comes next. Design a conversion funnel that follows typical models. Use standard best practices when deciding on the visual appearance of landing page elements, like testimonials, images, headlines and so forth. If you want to convert visitors, follow the pattern set by hundreds of other conversion funnels. Every experience is different. The experience that a user has on your landing page is going to be different from the experience that they have on your competitor’s landing page. When the user faces a process that is different from what they expect, they experience a sense of psychological distress. Maybe the landing page is longer than expected, or there is no button to click on, or they can’t find social proof. What then? Distress has interrupted the anticipation process and now the user wants to find a way to get rid of it. They can do so in one of two ways: through adaptation or avoidance. If they successfully adapt, then the user will feel delight, which is the psychological opposite of distress. Delight is exactly what marketers want a user to feel in the conversion process. Delight makes future positive action become more likely. Avoidance, on the other hand, is when a user removes themselves from the situation entirely. If you place unexpected elements in the path of the user, it causes their psychological anticipation mechanism to backfire. They will either create a new anticipation (adaptation) or avoid the problem (leave your landing page). If you make the adaptation process easy or obvious, then the user will feel a heightened sense of delight. Thus, a small challenge in the user’s progress toward conversion can actually improve anticipation through the feelings of delight that follow adaptation. A small challenge in the user’s progress towards #conversion improves anticipation and delight. 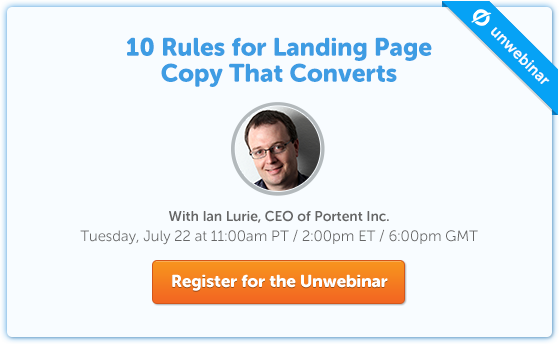 What easy-to-solve challenge could you introduce into your landing page or conversion process? From a psychological perspective, users went through a process of adaptation. They successfully solved the problem by watching the video. This produced delight and ultimately caused them to convert. Psychology is the driving force behind conversion optimization. How people anticipate things powerfully shapes how they will interact with your landing page or conversion funnel. The greater your grasp on the psychology of anticipation, the better you will be able to create a killer landing page that ushers in higher conversions. What techniques do you use to, um, anticipate your user’s anticipation? Let me know in the comments. 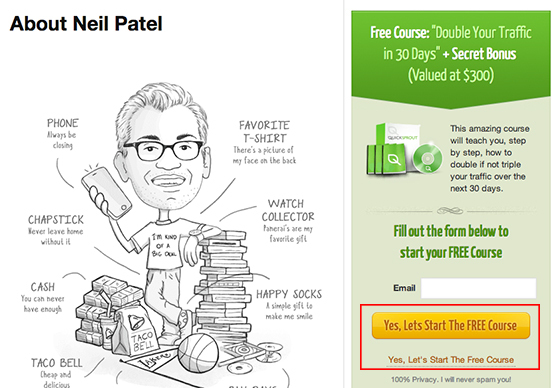 Neil Patel is the co-founder of Crazy Egg and KISSmetrics. He blogs about marketing at Quick Sprout.